Homophones - or homonyms - are fun but tricky. A little extra practice is always useful. Thanks, Bruce, for your help. 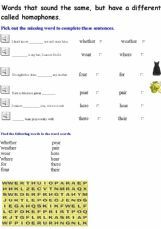 This OE is very useful, because it contains a lot of homophones, some very familiar and others not so much, it has different kinds of exercisses so, ss can practice and practice. I corrected the mistakes I had before,thanks a lot for all your kind observations. similar words with different meanings. 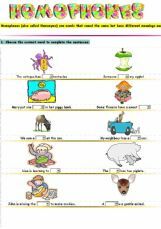 This is an overview of homophones which provides a basic understanding of the concept through a variety of activities. A quick exercise with easy definitions to help students understand the difference between than vs. then. This exercice is made to help students make the right choice between confusing words. Help to decide on when to use weather or whether - two words which are commonly confused in written English.